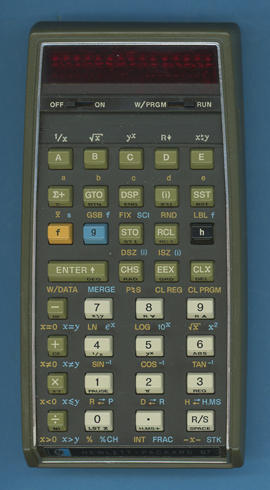 Size: 6.0" x 3.1" x 1.5"
Hewlett Packard improved the HP-65 in the year 1976 to compete with the Texas Instruments SR-52. The new HP-67 featured 224 merged program steps and 26 memories instead of 100 partially merged steps and 9 memories found in the HP-65. The HP-67 still uses the Reverse Polish Notation with the ENTER key instead the usual = key. The rivality between users of Hewlett Packard and Texas Instruments battled a long time introducing a lot of funny benchmark programs and programming tricks before the HP-41C appeared.